Leadership is a subject that every working person has an interest in because they are either in a leadership position or they are followers subjected to the work and whims of a leader. Because there are more followers than leaders, the quality and effectiveness of leadership has a great impact on the daily work and home lives of many people. Great leadership can improve one’s life and well-being, while bad leadership can be a source of immense job dissatisfaction, stress, frustration, and unhappiness. Unfortunately, there are many more bad leaders than good. What’s worse is that bad leaders often get promoted many times, and the positive feedback coming from those promotions means they rarely see any need to improve their leadership skills and capabilities. Bad leaders fail to realize three very important things: 1) the negative effect they have on the physical and mental health of followers, 2) their role in slowing down and blocking of information flows, and 3) the inability of the group or organization to rapidly respond to changing conditions. Because leadership is so important, much effort is expended to study it and understand what constitutes good leadership. The image at right shows the four areas of leadership study, the middle two being the traditional areas of focus. Within each of these four areas, there are many levels of “Respect for People” that help illuminate the differences between good and bad leadership. Let’s begin with leadership behaviors because that is by far the strongest area of focus and which has received the greatest attention. This area has been explored by many people for about 100 years. There are virtually no new discoveries to be made, expect for what neuroscience research will tell us in coming years. Otherwise, we know well the specific behaviors that constitute good and bad leadership. 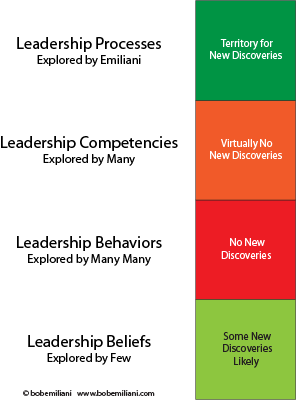 Next comes leadership competencies, which has also been thoroughly studied and written about for decades. Here too there are likely to be few new discoveries. Nevertheless, it is very helpful to understand how the great difference between Lean leadership competencies compared to conventional leadership competencies. Leadership beliefs are not as well studied, in large part because the beliefs of businesses leaders are widely assumed to be the same. But, they are not. We know empirically that the economic, social, and political beliefs of Lean leaders are much different from the beliefs of conventional leaders. Some new discoveries are likely to be made once researchers recognize the difference between Lean management and conventional management. That could take a while, however. Last, we have leadership processes, which is an area that, as far as I know, I am the only one to explore. People do not think of leadership as consisting of various processes that can be understood and improved using the Scientific Method. They link of leadership as an art (i.e. behaviors) that are strongly dependent on one’s personality. While this can be partly true, thinking of leadership in terms of processes enables one to solve problems that cannot otherwise be solved. It offers a clear and specific road map on how to improve leadership, something that both the art-based leadership behaviors and leadership competency approach to improving leadership fail to do. Improving leadership by improving behaviors and competencies is hard work, some of which is necessary. Understanding the direct connections between beliefs, behaviors, and competencies put leadership on a firmer art and science footing. However, leadership processes goes much further by both strengthening the scientific aspect of leadership and simplifying the challenge of improving leadership. That means that more a much wider group of people can become effective leaders. Along the way, followers and the organization as a whole benefits though improved human health, better information flow, and greater ability to quickly respond to changing conditions. Whether you are a good leader, a bad leader, or somewhere in between, you can improve your skills and capabilities by continuously improving your understanding and practice of Lean leadership. To that end, I hope you will read and learn from Practical Lean Leadership and Speed Leadership.